Old acquaintances, new faces, and quite a few jaw-droppers! 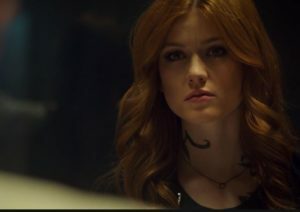 Shadowhunters 3×17, Season 3, Episode 17, “Heavenly Fire,” Aired April 8, 2019. Happy 50th episode, everybody! What a great ride it has been so far – and luckily, it’s not over (yet)! Action-packed and full of jaw-droppers, this week’s Shadowhunters once again is a mixed bag of everything. We meet old acquaintances, get to see new faces and watch as unlikely alliances are forged in a joint effort to stop a madman from erasing the Downworld. As befits the occasion, there are a lot of surprises – unfortunately, not all of them good. But what would Shadowhunters be without some drama, right? Let’s break down this episode and watch one Simon Lewis take center stage – and save the world in the process! News on Heavenly Fire – and it’s not glorious at all! We already know that Simon and Izzy make one hell of a team – but this week, they are really at the top of their game! When Izzy asks Simon for help to save Clary, he immediately agrees, even without knowing what Izzy’s plan entails. He is the best friend everybody needs: Always supportive and completely selfless. And: Can we please talk about character growth? Because Simon has come such a long way! As an undercover prisoner inside the secret Heavenly Fire facility, Simon makes a few unsettling discoveries. Prisoners are taken out of the holding cell and do not return. Later, our favorite Daylighter finds a room filled with all the Downworlders gone missing – but they are all mundane again! What is going on? When communication with Simon breaks off, Izzy and Aline join forces. It turns out that Victor Aldertree, the new Head of Scientific Development, has been going behind the Clave’s back, transferring prisoners to the facility to use them as lab rats. He injects them with “Heavenly Fire”, a serum that has been created from a fragment of the sword Glorious. This serum makes Downworlders mundane again – whether they like it or not. Consent? A foreign concept for this madman! Victor Aldertree: Villain extraordinaire or just completely delusional? While Aldertree believes to be “on the edge of a major breakthrough”, Izzy just thinks he is completely delusional. His aim is to purge the Downworld by slipping Heavenly Fire into the water supply all over the world, claiming it “will be a safer place once it’s free from demon blood.” Holy sh*t – delusional is really putting it mildly! Fortunately, our Shadowhunters/Downworlder team blows up his lab just in the nick of time. Aldertree is placed under arrest – but not before Izzy lands a good punch in true “We’re Lightwoods – we break noses and accept the consequences”-fashion – purely in self-defense, of course! While Simon, Izzy and Aline are busy bringing Aldertree to justice, Jace and Clary pay a visit to the basement of the Institute where Jonathan is still being held, Hannibal Lecter style. Unsurprisingly, he refuses to talk to anyone but Clary. Jace doesn’t like it one bit, fearing it will only strengthen Jonathan’s power over her – and he is not wrong. Naturally, Jonathan gets what he wants. He shares memories about his nightmarish time with Lilith in Edom – and it is not easy to stomach. It was then that he first learned about his sister and also the Morningstar sword, which can only be yielded by those with Morgenstern blood. The more we get to know about Jonathan, the more obvious it becomes that he is beyond saving. However, that doesn’t stop us from feeling sympathy for the devil when he breaks down, sobbing that Lilith was right about no one ever coming for him. The way he cries out: “You were supposed to be my princess” – we can keenly feel the betrayal he feels! The picture Jonathan paints about his time in Edom is a dark one and he depicts it so vividly that it resonates within Clary: She recognizes one scene he describes as something she had recurring nightmares about as a child. In order to help her deal with it, she even drew it in one of her sketchbooks. Jonathan at the window up high in that dark, dreadful castle, desperately yelling for help? It’s like a Disney fantasy gone bad! Nervous Alec, depressed Magnus = a perfect proposal? Let’s face it: It was foreshadowed right from the start that we wouldn’t see a happy Malec moment at the very end of this episode, so we braced ourselves for drama – and rightly so. Magnus accepts Alec’s invitation to a special dinner on the balcony (“How romantic. […] I’m one lucky man”) and Alec (“Not as lucky as I am”) spends all day planning and giving off nervous energy. Magnus, on the other hand, spends his day drinking – and it doesn’t help that he discovers a grey hair at one point, undeniable proof of his mortality. When he finally arrives late for the date, Alec quickly registers that something is wrong – but he doesn’t realize how wrong until the very end. Things get physical – although most definitely not in the way Malec fans would have liked – and the episode ends with Magnus sobbing his heart out against Alec’s shoulder. Fortunately, we are used to the feeling of having our hearts ripped out by now! While Alec’s intentions of proposing to Magnus during the most difficult time of his life have certainly been good, he fails to realize that Magnus has slipped into depression. It becomes more and more obvious that Alec isn’t able to understand just how much Magnus identifies with magic and thus, how insignificant and lost he feels without it. Granted, Magnus is a master at wearing masks, but recently, there have been many cracks in the facade. Where will Malec go from here? A victim of a “Heavenly Fire” injection, Raphael feels anything but. For him, being human again is a blessing – and we feel so happy for him! Only: Will it really last? It only took a glimpse at Helen to realize that there was more to her and that we liked her. The moment she turned against Aldertree to do what’s right? We dug her even more. When she slipped Simon some vials to help Clary? Instant love! Great debut, Sydney Meyer – we certainly look forward to seeing more of Helen Blackthorn! Color us surprised, because there were little to none of those moments recently. In fact, we wondered if the Parabatai bond had been severed after Jace died at Lake Lynn, as there was hardly any indication that it was still there. We’re glad it is, though – and would really like to see more exploration of it in the future. Of course Clary feels guilty once she realized that she was supposed to be the “princess” to rescue Jonathan from evil Lilith’ clutches. Luckily, Jace is right there by her side, supporting her and giving her strength. Will it be enough to stop her from becoming dark? Good vibrations! The chemistry is definitely there, as is the mutual respect. Let’s see how this turns out! …the return of salty season one Alec. Has anyone else experienced an immediate flashback to the “Who invited the vampire”-moment at Alec’s almost wedding or is it just us? Tell us your thoughts about Shadowhunters 3×17! Hit us up on Twitter and let us know! Watch Shadowhunters Mondays on Freeform! International viewers, check out Netflix on Tuesdays!